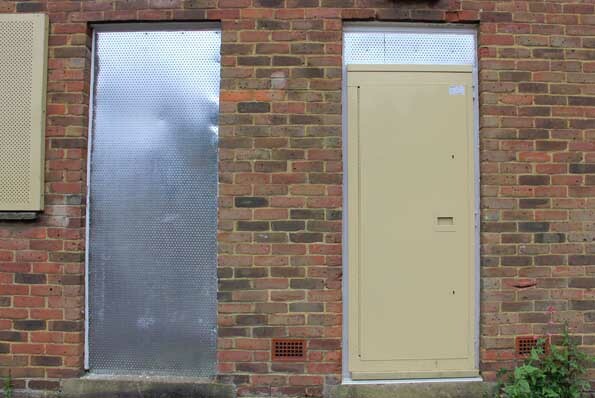 Our high-quality steel security doors offer a reliable, durable way to keep your vacant property or building site safe. Designed to replace standard doors, steel doors are an excellent solution for keeping trespassers, vandals, thieves and squatters out of a building while making authorised access still possible. Disused buildings and incomplete construction projects often attract the attention of trespassers, vandals and other kinds of low-level crime. If your property is not properly secured, you are leaving yourself vulnerable to criminal damage, squatter or traveller camps, liability for on-site injury (even to unauthorised persons), and the associated repair and legal costs. It’s important to take preventative action, which is why, at Maltaward, we provide a fast, professional installation service. Why choose steel security doors? Steel security doors cannot be breached without specialist equipment, making it virtually impossible for unauthorised access through doorways. Used in conjunction with Sitex security screens on window openings, steel doors protect vacant property from trespassers, vandals and squatters, resisting both brute force and fire damage more effectively than wooden alternatives. Maltaward security doors are made from reinforced steel, strengthened by steel rods encased in insulative fibreglass. Doors feature a mechanical lock as standard but may be upgraded to a digital lock if preferred, and use a 12-point multi-lock system when closed. An expandable frame means that doors can be fitted to a range of opening widths, and heavy-duty hinges with anti-tamper bolts keep them in place. Our steel security doors are installed and removed by our professional teams all over the UK, and cause little or no damage to the exterior of your building. Expandable frames allow for quick, secure installation on-site, and doors can be easily dismantled and removed once no longer necessary. To keep the rest of your vacant premises secure, we recommend using steel screens to cover windows and non-critical doors, and using fencing or concrete blocks around the perimeter and across roadways. If you need any assistance in choosing the most effective security measures for your site to prevent trespassers, vandals or fly-tipping, our friendly team would be happy to discuss your requirements. Contact Maltaward today for professional installation of Steel Security Doors, or for more information about how to keep trespassers, vandals and squatters out of your property. Call us on 0800 043 2742 or use the form found on our Contact Us page. Use the form below to contact us for all your security needs!